It does not take much intuition or imagination to relate Paul Klee’s “Monument in Fertile Country” (1929), to an aerial photograph. 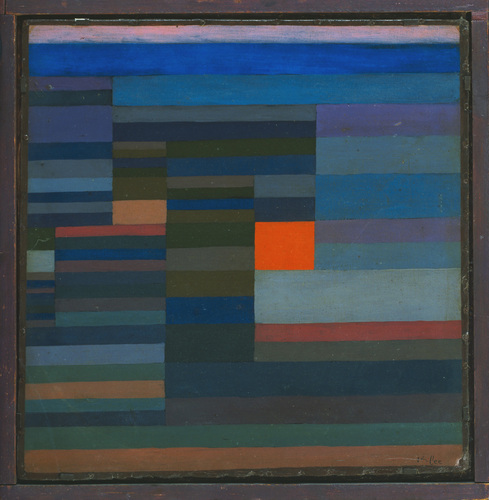 As the painting comes from a period right after the artist’s trip to Egypt in the winter of 1928 – 1929, it does not take much research either to find a location bearing from above a striking resemblance to Klee’s painting: almost any area around the Nile displays the same interplay between dark fertile plots and bright, blank blocks of desert lands. Yet the “Monument” is only an example of a more general idea with which the artist experimented at that time and, though simple, is purely mathematical at its core. Beyond the immediately obvious, what is clearly different in the two pictures after only a little inspection is that Klee’s “Monument” is not a nearly random arrangement of colored stripes and blocks but rather a careful composition of mathematical nature. And just as the same abstract mathematical law can often be applied in a variety of different situations, Klee extends the same abstract idea in a series of similar paintings beyond the aerial view explanation, providing new imaginative ways of interpreting the colored blocks pattern. Paul Klee (1879 – 1940), a German – Swiss, was a notoriously innovative artist. During his nearly forty creative years Klee produced an amazing array of more than 9000 pictures, more than one picture for every couple of days on average, using a dozen different techniques. His pictures, displaying a character equally as pictorial as poetic, are often playful or humorous, sometimes autobiographic, sometimes ambiguous or enigmatic and almost always innovative. Klee’s production is not dominated by a few masterpieces casting their shadow on the rest of the yield. Each and every picture is unique in its own way, resembling a “kurzgeschichte” or a poem, or even perhaps a short melody, its interpretation often revealed by a surprising, imaginative title chosen by the artist. Klee, the son of a music teacher and a singer, played the violin and under his family’s influence had early in his life set forth to becoming a musician, a pursuit he soon abandoned in favor of painting. His work as a whole is now often recognizably influenced by music; however it provides an encyclopedic variety of techniques, styles and themes. Quite a few of his pictures cannot be considered as “beautiful”, at least not in the conventional, widely accepted sense of beauty, and some of them can be described as disturbing or even ugly. Klee himself commented on that using a mathematical metaphor: “to emphasize only the beautiful seems to me like a mathematical system that only concerns itself with positive numbers”. Geometry plays a key role in Klee’s work as his compositions were at times dominated by geometric shapes: circles and orthogonal blocks, polygonal shapes, parallel lines and continuous curves, single strokes that fold to create forms. Places and caricatured human characters, theatrical compositions, imaginary animals and plants, political statements, autobiographical notes, mythological characters, sensations and even allusions to science are mostly presented symbolically in a simplistic, fairy – tale manner, often paradoxical, enigmatic or dream – like. In a clearly polyphonic manner, he often uses a specific style to permeate a number of different themes. 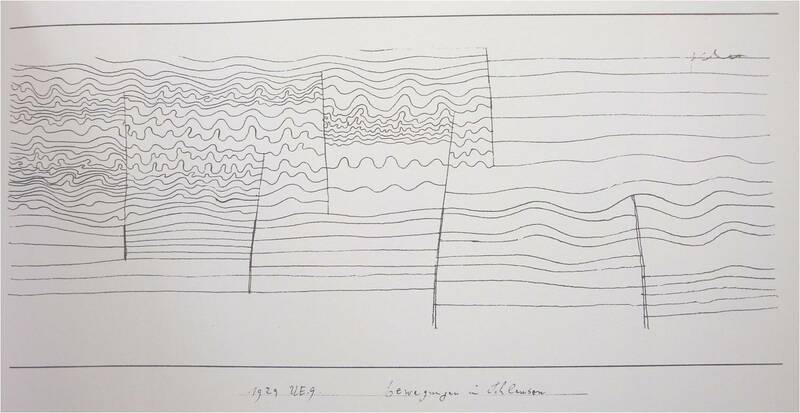 Several of his works following his trip to Egypt display the use of orthogonal building blocks and stripes organized in “strata”, as Klee himself named the horizontal arrangement of his orthogonal shapes in one of the pictures in this series (“Individualized Measurement of the Strata”). 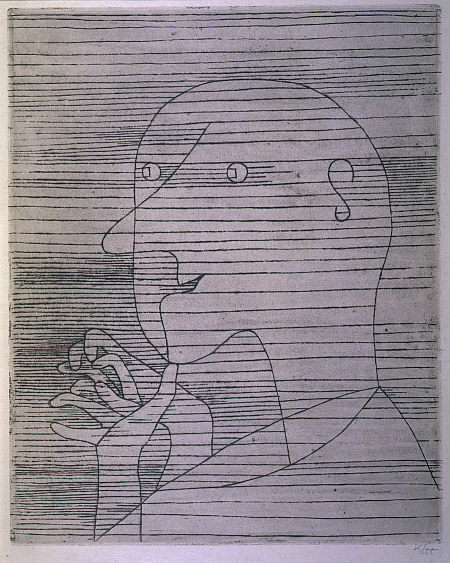 In the humorous etching titled “Old Man Calculating”, where the bald caricature of a toothless old man is likened to that of an infant, the strata simply facilitate the construction of the figure “exotopically” i.e. more by using shading outside the form, a favorite technique of the artist. Moving across the picture, the strata double in number and become denser each time they meet with the man’s outline. In the “Monument in Fertile Country” the artist takes a step further and makes use of the strata and the doubling to achieve a description of the emergence of complexity. As we move away from the dune colored blocks in the middle, supposedly approaching the water of the Nile, the land becomes fertile and complexity arises in a rigorous, mathematical way. The dark colored fertile plots appear after successive doublings in accordance to a geometric progression: 1, 2, 4, 8, 16. 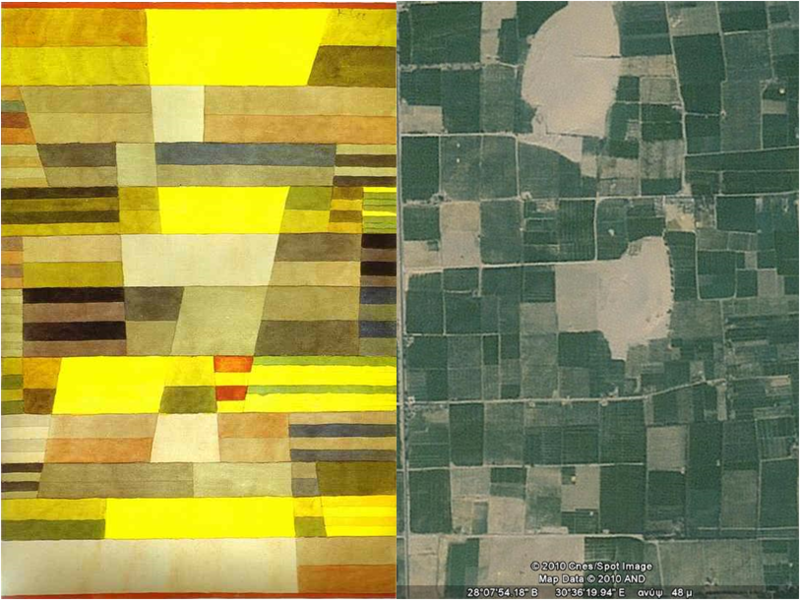 The same progression appears in another variation of the same theme (“Monument on the Edge of Fertile Country”) where Klee offers an aerial view of the edge of the desert progressively turning fertile towards the west. An aerial or “bird’s eye” view is offered also in “Highways and Byways”, where the landscape appears obliquely to create the illusion of perspective and relief. Here complexity emerges geometrically by successive doublings from a central “highway” to create “byways”, smaller areas of dense strata, only to be lost again inversely by successively halving their number. Interestingly, Klee’s imaginative title of this painting suggests an interpretation other than the cultivated plots for his colored strata. With “Fire in the Evening” however, the strata, in a quite different range of colors, take a quite different meaning as they are used to partly conceal or partly uncover a blue hour landscape scene. Klee’s title acts as instructions on how to read his colored stripes and leaves no room for other interpretations. The strata provide only a partial view of the scene, again through the same geometric progression, making the detail denser only locally and away from the fire, which is rendered as a centrally placed glowing red block. Following Klee’s instructions, the land, the horizon and the sky are immediately identified and even a hint of twilight can be recognized, depicted as a long, pink stratum on the top of the picture. Then the painting strangely titled “In the Current, Six Thresholds” takes the strata and the geometric progression idea to a different level. Klee had explored in a series of sketches the flow of water as it gradually turns from laminar (smooth) to turbulent and apparently perceived the transition to turbulence as a successively increased complexity. His ink sketch “Movement in Locks” depicts a right to left flow across six obstacles. After each obstacle, the flow’s pattern becomes increasingly complex until, in the far left, unstable vortices or eddies appear in various scales, some even moving in the inverse direction of the flow. As these qualitative features are actually characteristic of turbulent flow, Klee had by intuition correctly perceived and depicted turbulence. Moreover, as the sketch’s title refers to some undetermined “movement”, turbulent flow as perceived by Klee is not restricted to water or liquid but is left open to extensions to any fluid, as indeed is the case with the phenomenon. 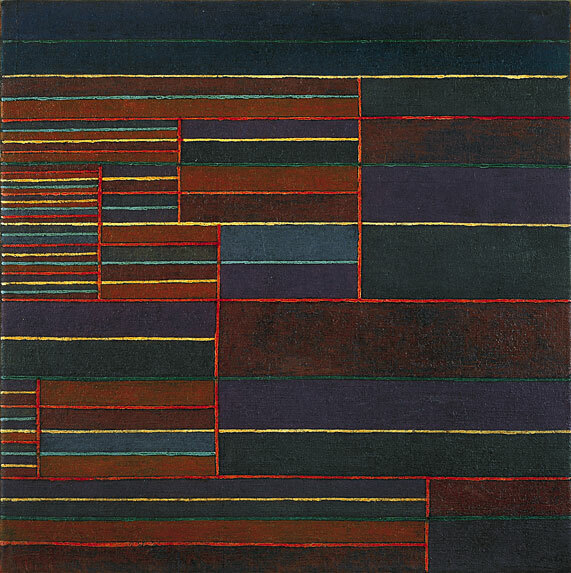 Klee proceeded in applying his strata idea in the representation of his perception of turbulence: the result is the “Six Thresholds” where the transition to turbulence is made through the successive doubling of the strata. Turbulence, a theoretically unsolved problem in Physics, has been associated with the so called “Chaos Theory”, a field of study which inhabits the region between Mathematics and Physics and examines systems highly “sensitive to initial conditions”. To understand why turbulence is a “chaotic phenomenon”, suppose that two corks float on the surface of flowing water. In the case of laminar (smooth) flow, a fairly accurate prediction of the movements of the corks can be made. Had the two corks been close to each other in the beginning of their movement, they would also be close to each other in the end. Moving slightly a cork from its initial position would not make a big difference to its final position: the outcome of the laminar flow is not sensitive to initial conditions. In the right side of Klee’s “Six Thresholds” the large, broad strata are used to indicate such a laminar, predictable flow. However, in the case of turbulent flow, the corks would float amongst various, unstable, local, smaller or bigger vortices and eddies that make their movement unpredictable. Moving slightly a cork from its initial position could make a big difference to its final position and the initially neighboring corks may end up far from each other after some time, in a quite unpredictable way. The movement of the corks in the turbulent flow is thus very sensitive to initial conditions. In the left side of the “Six Thresholds”, the turbulent flow is depicted by an increased complexity of the strata arrangement using the geometric progression or “doubling” route. There has been a lot of study on how the transition to chaos is made and several routes towards chaotic behavior have been examined in various phenomena, including turbulence. 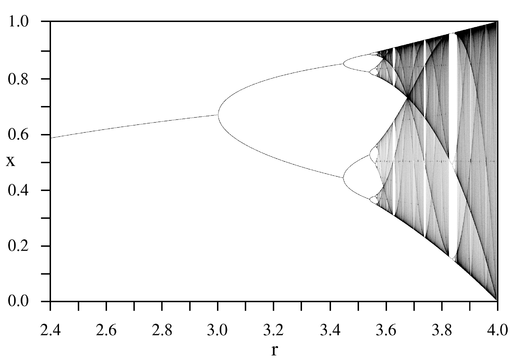 One of the chaotic transition scenarios involves a successive doubling and is best understood using the so called “logistic map”, a mathematical iterative rule proposed in the mid seventies as a demographic model, though well known in a slightly different form since the early nineteenth century. The logistic map is elegantly expressed by the rule X=rx(1-x) where r is a positive parameter. After an application of the rule for an arbitrary x, a result X is produced. In order to get the map going, this result must replace x in the right hand side of the equation and produce thus a new result X which in turn should replace x and so on. Depending on the value of r, the behavior of the map varies greatly: some values of r lead to the monotonous repetition of the same X over and over again, while some other values of r produce the alternation of several specific X’s over and over again. Such cases as the latter are called “periodic” and the logistic map produces, as r is increased, a period 2 solution, then a period 4, then a period 8 and so on in a successive doubling of periods. Obviously, a periodic solution is stable and highly predictable and there is nothing chaotic about it. Each time the map switches to a higher period, a bifurcation appears in the graph of the system creating an image that brings to mind the way a cascade separates into smaller currents and droplets. Soon, when a certain threshold in the values of r is crossed, the periods cease to appear and the solutions produced by the logistic map become unpredictable. For these values of r, the logistic map becomes very sensitive to the initial value of x, displaying thus a basic characteristic of chaotic behavior. Such a route to chaos is called a “period doubling scenario” and the resulting graph, highly reminiscent of Klee’s strata, is a “period doubling cascade”. The logistic cascade is a fractal, a peculiar, rough geometric object whose smaller parts are size – reduced copies of the whole, a property which is called self – similarity and is closely connected to chaotic systems. Any fractal is an irregular, rugged shape whose irregularity remains the same in every scale. Klee’s “strata” paintings seem to suggest a similar cascade sequence that may be imagined entering into smaller and smaller scales, producing images with evident self similarity. Beyond the technical part of Klee’s construction, the artist seems also to bring forward the philosophical idea that a simple mechanism may be responsible for complicated, non Euclidean, fractal geometries such as the geometry encountered in nature. As this series of paintings were inspired by the trip to Egypt, there is an immediate link between Klee’s strata and the natural and cultural environment of the banks of the Nile. From the colored stripes of the “Monument” that represent the alternation of fertile and desert lands, down to the minute vortices of the “Six Thresholds”, that may represent the waters of the Nile, Klee observed or discovered in all scales the same complex structure and even found a simple mathematical mechanism to reproduce them rigorously. His ideas and intuitive concepts, as expressed through his “strata” paintings, display a remarkable similarity in content and in form to the scientific ideas and results found in modern Mathematics and Physics. is a great artist, who inspired many painters, including me.